While I continue to grow my art collection I often come across artworks which I am unfamiliar with. Certainly with the following pieces my naivety is abundant and so I research to increase my knowledge and appreciation of the artworks themselves. A thangka is a religious painting. #Thangka painting evolved as early as the ninth or tenth century and has remained popular to this day. 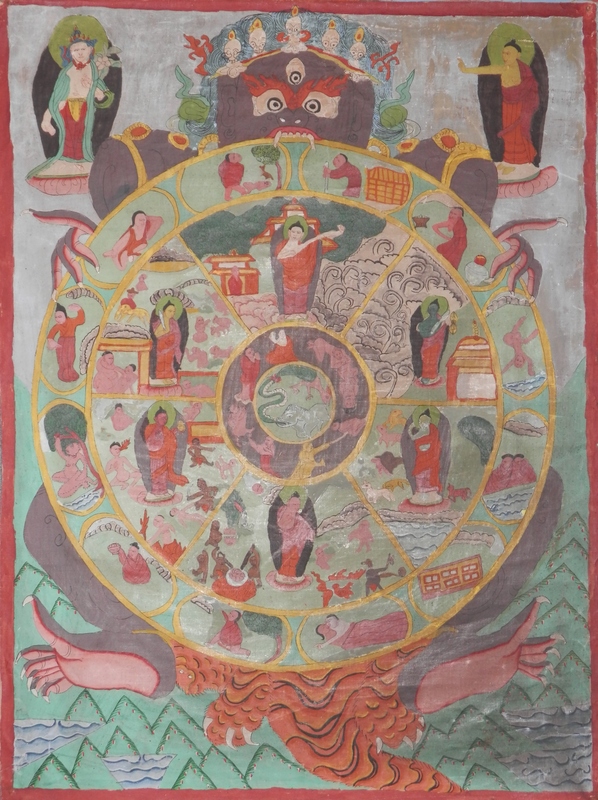 Early Thangkas are simple in design and composition. The main deity, a large figure, occupies the central position while surrounded by smaller figures of lesser divinities. Tibetans do not sell Thangkas on a large scale as the selling of religious artifacts such as thangkas and idols is frowned upon in the Tibetan community and thus non-Tibetan groups have been able to monopolize on its (thangka’s) popularity among Buddhist and art enthusiasts from the west. The #WheelofLife to the left is crude and naive. It lacks the finesse and intricacy of many thangkas which are seen today as well as in the second of my thangkas. The #LifeofBuddha is a much finer example of what a thangka can be. As a religious image it can be used as an icon but it is also meant to be a religious experience for the artist while rendering the image. Thangkas are painted on cotton or silk and are highly geometric. All elements of the painting are all laid out on a systematic grid of angles and intersecting lines. 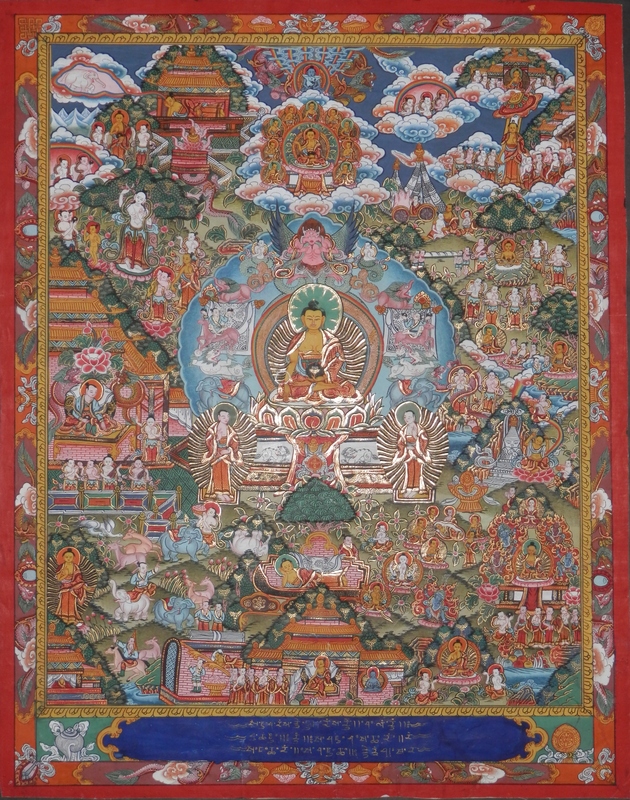 A finely rendered thangka can take over two months to paint. A skilled thangka artist will generally select from a variety of predesigned items to include in the composition, ranging from alms bowls and animals, to the shape, size, and angle of a figure’s eyes, nose, and lips. The process seems very methodical, but often requires deep understanding of the symbolism involved to capture the spirit of it. #NyomanTapa (1958-) is a Balinese artist with a very fine touch. 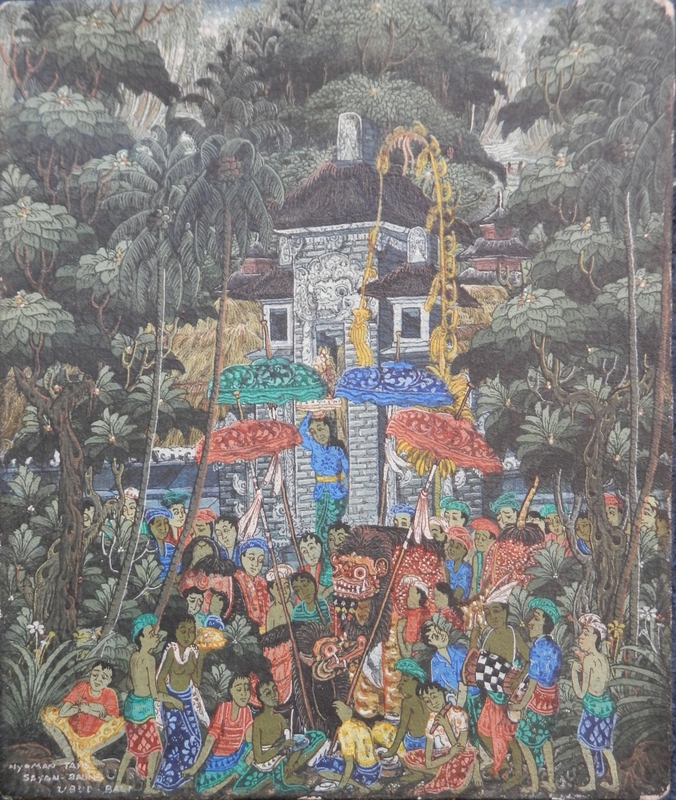 He paints wonderfully colourful and intricate religious celebrations and festivals as well as Balinese life images. This entry was posted in Oil Paintings and tagged Bali, celebration, dancing, disciples, feast, festival, life cycle, Nepal, temple, thangka. Bookmark the permalink.